Nicaragua has two main travel seasons. There is the rainy season and the dry season. The weather is dries between January to April, with the wettest parts of the year occurring between May and October. For fishing, April to July is generally considered the best time to go. There is a wide range of accommodation available to suit every budget. There are the Best Western, Crowne Plaza and Hilton hotels, with the Intercontinental Hotel being considered one of the finest hotels available. Nicaragua is the cultural and political centre of the country and there are a number of different places to visit and enjoy. Take advantage of car rental at reasonable rates and see all the great attractiosn the region has to offer. There is the Ruben Dario National Theater, the Victor Romeo Theater and the Justo Rufino Garay Theatre. There are the entrancing and lively markets of Masaya and historical buildings, such as the Cathedral of Leon, the Church of Jaleva to explore. There are also a number of national parks and reserves to learn about the unique wildlife of the area. Outdoor enthusiasts will be captivated by the number of activities there are to excite and interest them. Isla Zapatera is a national park which is one of the most important archaelogical areas. You can visit ancient tombs and structures. A visit to the El Velero beach is also recommended, as is a journey to the Caribbean coast to investigate some of the small ports. Car rental is necessary to enjoy all the attractions at your leisure. Booking online is easy and can be arranged before you travel. Due to a mixture of religious and native customs, there is a strong custom of fiestas, with each city having their own patron saint. The fiestas are a time of happiness and joy and usually begin with a parade. The people are very kind and hospitable and there is a great sense of safety and warmth. 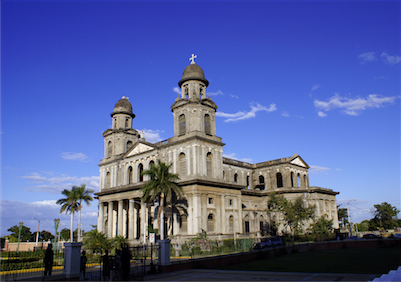 Spanish is a main language and defines the culture, architecture and art of Nicaragua. Managua International Airport serves as the main airport but it also has a good bus and train network. If you would really like to immense yourself in the culture there are tours which last 32 to 58 days. The public transport can be very crammed, the people you will meet are very engaging and friendly. The most convenient way to get around the region is by taking advantage of affordable car hire. Nicaragua is a land of colour, of creativity, of a varied history and of a unique character and charisma. It is a land of lakes and volcanoes. Even though it is the largest country in Central America, it is the one less travelled to. To miss out on this spectacular and inspiring country would be a real shame. Managua Airport is a popular rent a car destination, there are many car rental companies in Managua Airport with a wide range of different car categories. Many of our clients have rented a car in Managua Airport and had good experiences. Do not wait with booking your car for Managua Airport before you know prices will go up and the availability will get low. When traveling with family and children, we recommend you select a car with enough space for luggage and enough space to fit child seats. Children must travel save in a child seat/booster depending on their weight or how tall they are. Rentalcargroup.com offers a wide range of variety of station wagons, mini vans in Managua Airport. In Managua Airport, many car rental companies offer different types of cars, from small cars to large SUVs. Rentalcargroup.com has made it easy for you. Simply filter the results. If you are looking for an SUV, click SUV and you will see all the SUVs you can choose. You can also see if the SUV is a 4 * 4 guaranteed, because not all SUVs are guaranteed 4 * 4. If you want a guaranteed diesel car, use the search filter and you will have the guarantee that you will get a diesel car. Last month, the average car rental length at Managua Airport was 0 days. The average rental car length at Managua Airport is 7 days. The most booked rental car type currently at Managua Airport is cars. Last year, the most booked rental car type at Managua Airport were ECONOMY cars. How much does it cost to rent a car at Managua Airport? Last month, the average car rental price was 0 USD. Last year, how much did it cost to rent a car at Managua Airport? Last year, the average car rental price was 83 USD. What is the current average daily price to rent a at Managua Airport? Last month, the average rental price was NAN USD per day. How much did it cost to rent a car at Managua Airport over the past 12 months? Last Year, the average rental price was 12 USD per day. The car rental companies available at Managua Airport are: Alamo, National. See below last 5 customer reviews. Our customers rated Managua Car Rental with an average of 0.00 based on 0 ratings.